Free Shipping on most of our items. This is a Blue Beige Dhoti Kurta Indian Ethnic Dress for Boys. Traditional Design east Indian Dhoti Kurta costume for any occasion - birthday, wedding or for celebrating festivals. Once we receive your order, we will email you the exact measurements and will ship the item only after receiving your confirmation. Please make sure to respond to our email as soon as possible. We would cancel the order 2 days after we receive no response from the customer. Please note that Indian Garments can vary in size depending upon the manufacturer. It is always advisable to contact us before ordering if you are not sure on which size to order. It is our store policy to not ship any item until we receive a confirmation regarding the measurements as that would save a lot of hassle for our customers and us as well in terms of shipping the items back n forth. We ship via USPS and most orders will ship either the same day or the next business day (upon receiving your confirmation regarding the measurements). We carry only the best and the top quality merchandise and stand by the quality, your satisfaction is our top priority. In case of material defect, we will gladly exchange the merchandise. In other cases, you can return/exchange any merchandise within 3 days of receipt of your shipment to a maximum of one time only. A 20% (min $10.00) restocking fee plus S & H will be charged for all returns and exchanges. Always, contact us for any questions you may have regarding the sizing. We usually respond within 1-2hrs on a business day. In case your ITEMS are RETURNED DUE TO INCORRECT ADDRESS the additional shipping cost will be billed to you. Original shipping even if an item is shipped with FREE SHIPPING option is deducted from any refund. This item in Dhoti Kurta for Kids category was first added to our catalog on 09-02-2017. Buy Blue Beige Dhoti Kurta Indian Ethnic Dress for Boys, sold & shipped by Varshini Collections where you can shop online for Kids Ethnic Indian Wear & Ladies Kurtis. 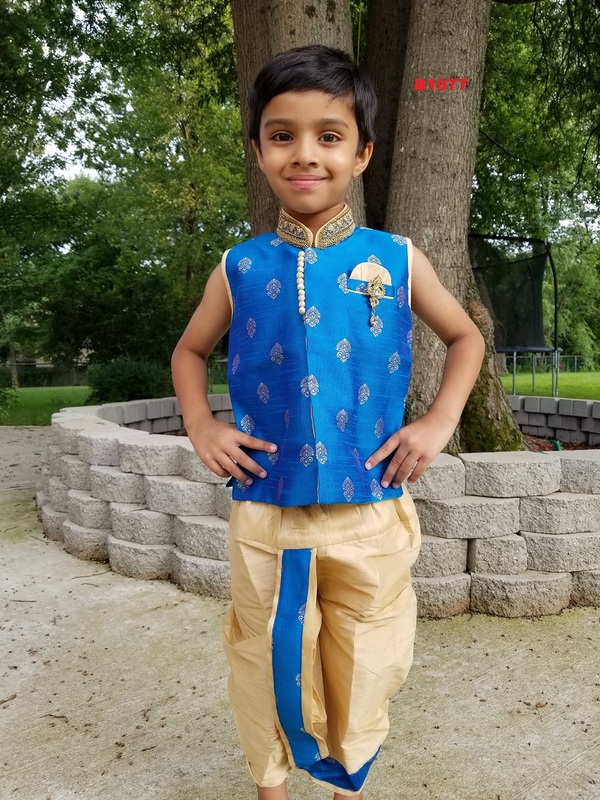 This Dhoti Kurta collection has been tagged as New Born, Baby Boys Traditional Dress, Kids Wear, Boys Indian Clothes, Children Party Wear Outfit. Disclaimer: There may be Slight variation in image color as seen on screen due to the lighting and screen settings. Thank you for starting this shopping service. I recently purchased Indian grocery, bollywood dvds and some beautiful Indian clothing and am very satisfied with the delivery time and quality of the products.